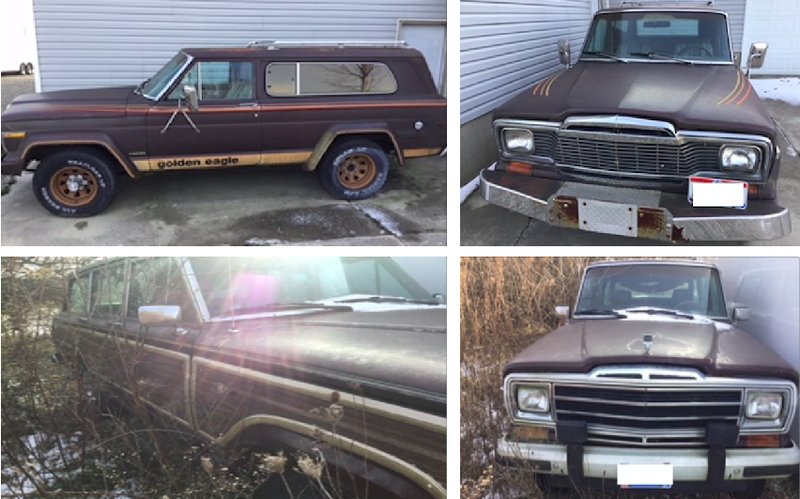 A reader just sent an email telling me about two Jeep SJs (one Grand Wagoneer and one Cherokee Golden Eagle edition !!!) that she’s got to get rid of for dirt cheap. “Would you know of anyone who would be interested?” the email reads. After yelling “BOY WOULD I!” at the top of my lungs and hyperventilating into a paper bag, I reeled myself in; this has to be a trap, right? Being an auto journalist is a dangerous job; there’s always someone out there trying to get me for some little mistake I may have made about how the Porsche Cayenne’s rear steering rack uses a ball screw instead of an acme-threaded screw (get over it MinorCorrection!). As such, I have to watch my back at all times. That’s why the last time a reader invited me to his apartment to offer up a “free Jeep Cherokee,” I was skeptical. Surely that was all part of a plan to murder me and use my skin as an engine gasket set, I thought. Well, it turned out to be legit. Or maybe it didn’t, because the reader ended up getting his Jeep fixed for free, and I drove home empty handed (but feeling damn good, I’ll admit). Look. I’ve got seven cars at my house right now, none of which function properly. I joke a lot about how things are getting out of hand, and I really need to stop buying cars blah blah blah. None of that matters right now. Logic gets tossed out the window when the subject of conversation is two freaking rust-free Jeep SJs. Two. Just look at that picture above and tell me I’m wrong. Tammy told me she’d let them go for under four grand for the pair, and sent over her address; apparently she only lives four hours from me! How is this not a trap? The Jeep gods. I think they’re shining their light bars upon me. Because I just got off the phone with Tammy. Either she is literally the best actor in the history of acting, or she’s a genuine car nut with a 1967 Fairlane and a mechanic as a dad who taught her to love all things automotive. And also, she told me her late husband—a civil engineer who used to race a Cherokee Chief in road rallies (she’s sending me pictures of the Jeep rallying; I can’t wait to see them)—was a diehard Jeep nut. This might not be a trap. And if it is, I’m looking forward to acting as a damn good gasket for an AMC 360. Wood. It is best on Jeeps.